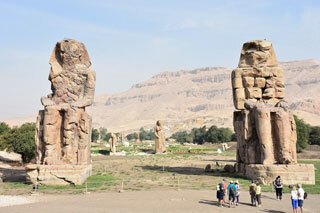 The Colossi of Memnon (locally known as el-Colossat or es-Salamat) are two massive stone statues of the Pharaoh Amenhotep III, who reigned in Egypt during Dynasty XVIII. For the past 3,400 years (since 1350 BC), they have stood in the Theban Necropolis, located west of the River Nile from the modern city of Luxor. This article uses material from the Wikipedia article "Colossi of Memnon", which is released under the Creative Commons Attribution-Share-Alike 3.0 License.